Post-apocalyptic America where few humans remain. They fight over a bible because they believe it to be a book which will give whoever possesses it power in a literal sense. Eli is some sort of a Rambo-styled lone ranger who makes it his mission to deliver the bible to someplace safe in the west based, on his faith. Meets good and bad people along the way. 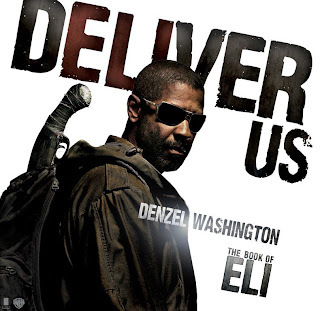 I have to give Denzel Washington’s acting ability a 5 out of 5 here. He actually breathed life in an otherwise very poor and quite nonsense story. Okey, so faith could make somebody do near miraculous deeds. I’ll buy that. But, why would Eli protect the bible with his life from getting into other people’s hands when the whole point of his mission bottom line of his mission is to spread it? Anybody see any contradiction of principles here? I find myself having difficulty “suspending disbelief” as a movie viewer. Besides, to make a movie about post-apocalyptic humans fighting over a bible is stretching silly a bit too far for me. Entertainment value? 1 out of 5. At least his acting was good. Definitely not going to go see this one. great review and thank you for being honest! I saw it with my housemates not long ago and although there were holes etc, I thought it was overall fairly entertaining. I mean, there's no way I'll be buying the DVD or anything but the overall feel of it was an okay way to spend a couple of hours. Watch the movie again a look for clues. Was Eli blind? His mission was not to share, but to deliver it, "Out West". But, to who? I think, your "holes", are things, we as viewers, are to fill in. Not, a mindless escape move, but a thinking one. I watched a bootleg download version. I'm going to see it again, on the big screen. To see if I can fill in, some of the "holes"
Nice review. I need to see this. Yes, Eli's mission is to deliver. But the end point of that mission is to spread the word. Why print multiple copies of it? I think those "holes" for viewers to fill in, are for the faithful, not for a lay person like me. Because I saw no holes, just a nonsense story.